Clean water is something that many of us take for granted, but how clean is your water, really? Public water systems must pass routine testing, but what all does that testing really include? In my GO Berkey Water Filter Review, I did the research that I want to share with you. Water systems are treated with chlorine to kill bacteria and viruses, but how healthily is that residual chlorine in your drinking water? Many pesticides are not regulated or tested in most municipal drinking water systems. My water source comes from a local well and I thought it was safe because there is no added floride or chlorine added to the water system. That was until two different hair dressers told me that I had a lot of hard water build up on my hair–yikes. That same mineral cocktail is going through my body as well. 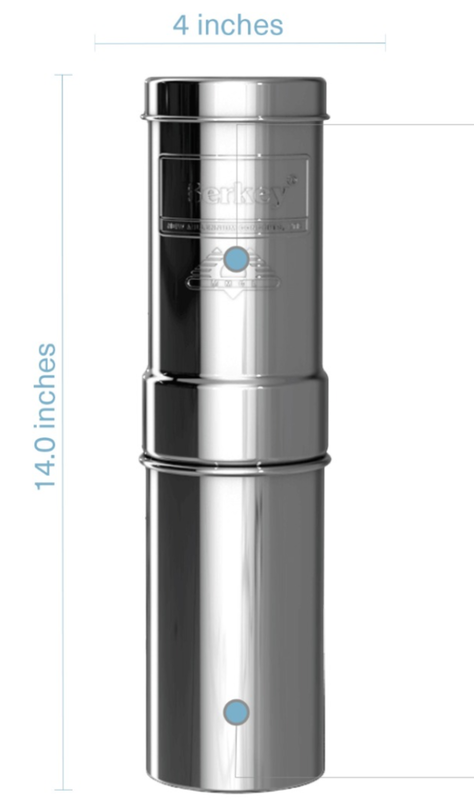 So, I researched and found the Berkey Water Purification systems to be just the solution I was looking for. Another consideration was to find a water filter that can be used during an emergency when water may become contaminated due to flooding. With escalating mega storms that threaten drinking water and incidents such as the high levels of lead in Flint, Michigan, it’s a great idea to have a GO Berkey water filtration system at the ready. What is a GO Berkey? 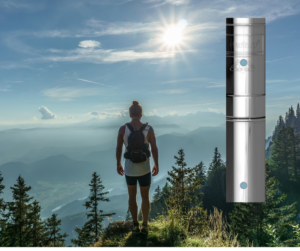 The GO Berkey is a high quality and cost effective water filtration system designed to purify water (not just filter it) at home or while you’re on the go. It is designed for portability so that you can easily pack it most anywhere you go. GO Berkey is innovative and attractive whether you stick it in a back pack or leave it on your kitchen counter. This system passes the “Red Food Color Test” and actually removes food coloring from water. The GO Berkey is ideal for 1-2 person household. For larger capacity you may need the Big Berkey Water System. 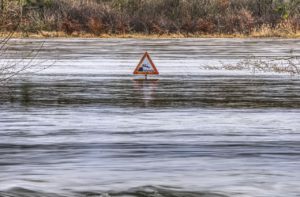 Like most geographical areas, you may be at risk for flooding, earthquakes, landslides and other natural disasters that could make your local water supply unusable. I placed a 50 gallon food grade barrel in my back yard for an emergency water back up. When the power goes out, the well system I am on doesn’t pump water. 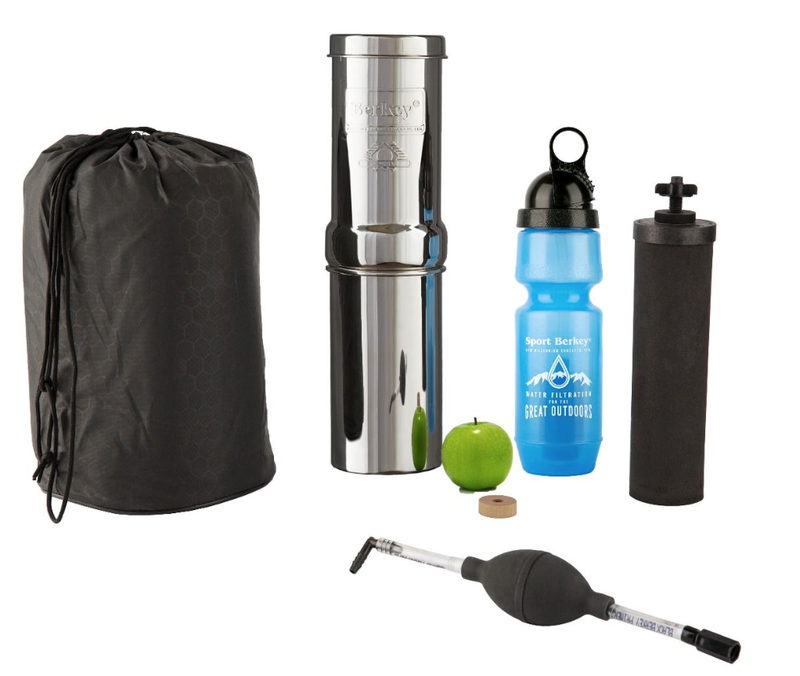 With my GO Berkey water filter, I can purify that standing water and have some peace of mind. But I find I use it every day. 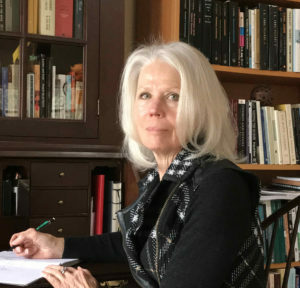 I have found it more than adequate to meet my in home use needs for one person, and I love to take it with me when I travel. Since my kitchen is on the smaller side and open to my great room, I wanted something that was not only highly effective, but also a water purification system that doesn’t take over with unsightly hoses and tubing. I have found the GO Berkey water purification system to be attractive on my counter and highly effective. I know that I’m drinking really high quality water now, not only because it tastes so much better, but also because Berkey publishes their third party testing on their Berkey website (and scroll down). A single filter treats 3,000 gallons of water! Berkey Filters offers free shipping on all orders over $45! Purifies water without using harsh chemicals. This means that it filters 99.9% of bacteria and viruses as well as other contaminants like lead. Berkey filters are tested in independent EPA-approved laboratories with impressive results, and sets a new standard for the water filtration industry. Excellent for emergency situations where your water supply may be compromised. 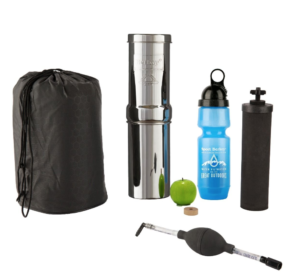 The GO Berkey is great for backpacking, camping, or other outdoor recreation where clean potable water may not be available. 203 contaminants are removed including: viruses (99.999%), pathogenic bacteria (99.9999%), Chloramine (below lab detectable limit), trihalomethanes (99.8%), pharmaceuticals (99.9%), pesticides (below lab detectable limit),heavy metals. Click here for full list of toxins. The GO Berkey is not compatible with a spigot, which is preferable for me since the unit is easily picked up. The bottom chamber can be used as a cup. I prefer to fill a ceramic pitcher of water that I like to leave out at room temperature. It sure looks and tastes a lot better than my old plastic Britta filter system, which doesn’t even compare in the water quality arena. How Do I Use the GO Berkey? The GO Berkey was easy for me to set-up and took just a few minutes. The instructions from the manufacturer are clear and basically you run water through the filter until it comes out clear. There is a circular part that helps create a good connection between your faucet and the filter. The filter then simple screws in. There is a PDF instruction sheet that’s fairly straightforward, or they have an awesome customer service department. I’m not the most mechanically gifted person and I didn’t have any trouble getting it set up. Once it’s set up, simply open the lid and fill with tap water. It takes just a few minutes for the water to filter through. I loved my GO Berkey that I went ahead and ordered the shower head, but I’ll talk about that in a separate review. For more capacity check out the Big Berkey. Read Product Review. 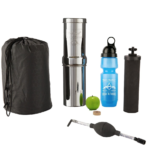 As the founder of HowToRelieveStressNaturally.com, I would love to hear about your experience with the GO Berkey Water Filtration kit. Please leave a comment below to share your experience or to ask questions that you may have or by using the contact form.